Sysbohr develops and produces tools and accessories for the entire range of drilling applications in diameters from 51 mm to 610 mm. From the technical design to the final drilling system, Sysbohr accompanies projects and adapts drilling systems to the customer's specific needs and individual soil conditions on-site. For the easy manipulation of double casing systems, in-house manufactured hydraulic casing handling systems are available. The casing lifters / handling systems are easily mounted onto mini excavators. Furthermore, hydraulic clamping and breaking devices for many casing dimensions are available. Equipment for double-head drilling rigs, as well as a large number of special designs are part of our development and delivery scope. State-of-the-art CNC lathe and milling machines, electronically controlled friction welding, inductive brazing and optimum hardening technologies are used to create precise and specialised products for any drilling task. The raw materials used are adapted to customer requirements and are sourced from well-known quality European suppliers. Worldwide, these products have been applied successfully and been instrumental in helping our customers achieve their objectives accurately, as planned and profitably. Work together with your team to specify drilling equipment. Provide specialist support during the planning process. Performance monitoring during the drilling phase. Adapt drilling tools to suit ground conditions. Obtain the best price / performance ratio through use of high quality materials. Rapid order turnaround to ensure products supplied within agreed time scales. 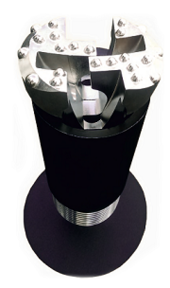 We develop tailor made products to meet difficult drilling conditions. 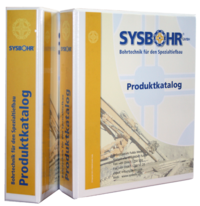 The Sysbohr GmbH product catalogue presents the full range of drilling systems in a clear and concise manner. This catalogue is free of charge and can be obtained as a hard copy or as a download. The various drilling systems can also be downloaded separately as pdf files. The catalogue shows the standard options for each drilling system and options from different drilling systems can be combined together if required. The Sysbohr team is happy to provide assistance if required. SysBohr Gmbh company has developed and tested a complete new generation of reaming drill bits, suitable for drilling with DTH and Top Hammer. They are mainly used in overburden formation with rock inclosure.